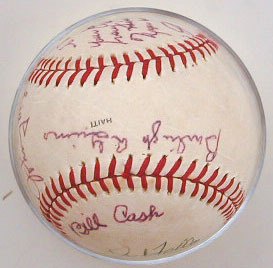 This baseball was autographed by HOFers Earl Averill, Burleigh Grimes, Bill Cash, Bob Feller and Johnny Mize. Also appearing on this ball is an inscription "to Matt: Your parents are dear friends of mine. I hope you will be too."